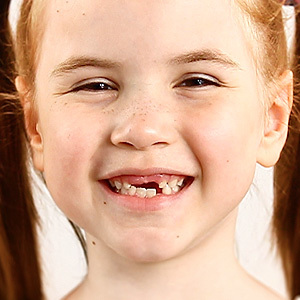 February Focuses on Children's Dental Health - Joseph G Vaughan D.D.S. Sure, you knew that already. But did you know that for effective cleaning, your kids should brush for two full minutes, twice a day? And despite reports you may have heard, the American Dental Association maintains that using an interdental cleaner (like floss) is essential part of good oral hygiene: It’s the best way to clean decay-causing bacteria from tooth surfaces that your brush just can’t reach. If you allow kids to have sugary snacks, limit them to around mealtimes. That way, the teeth aren’t constantly bathed in substances that can feed harmful bacteria. It also gives the healthful saliva a chance to neutralize acids that can attack the tooth’s protective enamel coating. That includes so-called “sports” and “energy” drinks, which often contain extremely high levels of sugar. These beverages, along with diet sodas and some fruit juices, may also be highly acidic, and can damage teeth. What’s the best drink for your kids’ health? Plain old refreshing water! Sure, in a few years, those teeth will be gone. But in the mean time, they have an important job to do: They not only contribute to proper speech, eating and appearance, but also hold a space for the permanent teeth that will follow them. If they are lost too early, problems with permanent teeth may follow. Routine office visits are the best way to monitor your child’s dental health and development, prevent disease, and solve minor problems before they get bigger. Plus, we can address any questions you may have about oral hygiene and a range of other topics. So if we haven’t seen your child lately, maybe February is a good time for a visit.